We are all sun lovers to some degree, and as Spring begins to blossom I always feel the desire to spend more time outside. 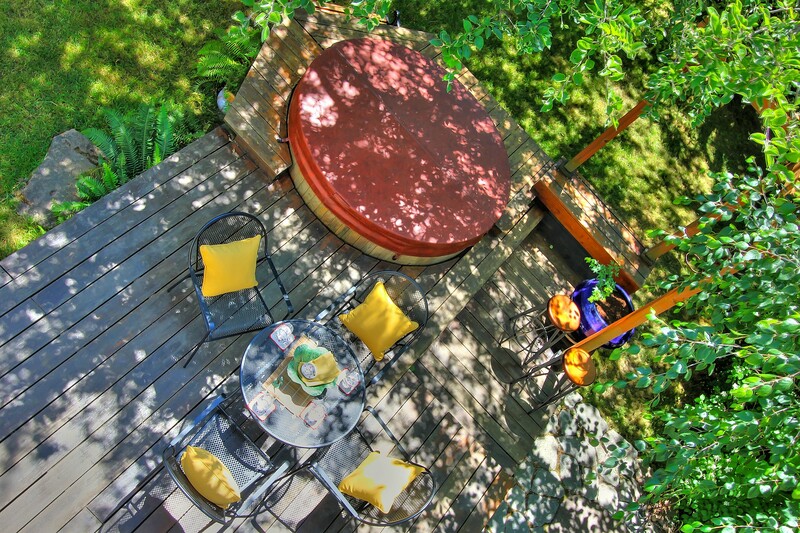 This photo is from an East Ballard home we listed and sold last summer that had a delightful deck with hot tub in the backyard. The old tree created a canopy for shade and privacy that made this space so very inviting. Having a tree, or swooping strings of garden lights, makes a fake ceiling for the garden room that is very comforting. Bringing in a few anchor pieces to sit on is the first step in building this space out, be they a picnic table, Adirondack chairs or beach chairs for that California vibe. Add some bright accent pillows and pots with Spring flowers and the space will transform into your favorite room. The look can be entirely different each year, even each month if you have a creative flair. Mostly, it is about making an outdoor spot that is your new destination for those sunny afternoons. Often the “best room” is outside where you can get away from everything and enjoy an hour or two of sunshine and solitude. As Spring arrives early this year, I’m excited to get started on our sunny spot in the garden and have just the mystery book to dig into once it is ready.